It's time... Time to take things to the next level. Time to get serious about your training and put in the work to become the best. It may sound tough, but don't worry. You're not in this alone. Here at Southpaw, we've got your back. Consider our Combat Ball your secret weapon on the road to success. Now you can train anywhere, anytime. Ensuring you're constantly improving while your opponents are dropping their guard and taking it easy. And with dozens of different exercises, you can make a custom training plan to cater to your skill level. Whether you're a beginner, expert, kid, or adult, our Southpaw Combat ball will have you improving in leaps and bounds. We'll be here with you every step of the way, and even send you some of our most popular training exercises to get you started. And while becoming a pro may take time, our Combat Ball will last the journey. 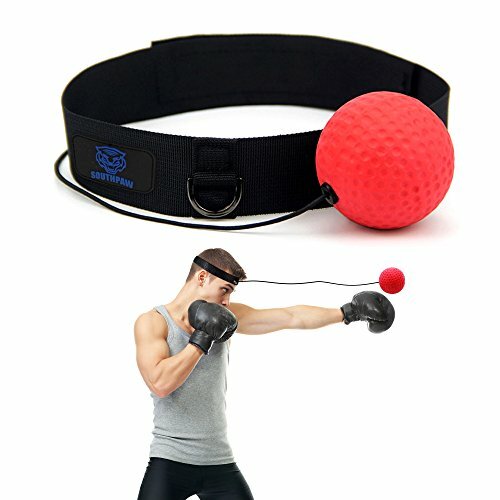 Specially created with an adjustable headband for comfort, tractable ball cord for varying difficulty and ball speed, and a durable, yet cushiony foam ball, built to last years but be comfortable enough to train for hours without any sore knuckles or bruises. We're so sure you'll love the Southpaw Combat ball, we even offer a 100% money back guarantee. So make sure you're the champion in your next fight. Order your combat ball today, before the competition does. BECOME AN EXPERT WITH EASE - The Southpaw Reflex Ball makes training and fitness easy. With only a little practice, you'll have Better Reflexes, Quicker Reaction Time, and Sharper Focus and Agility. Everything you need to crush the competition and have fun while you do it. TRAIN ANYWHERE, ANYTIME - Never miss a chance to hone your skills again. Unlike a punching bag, you can bring the boxing ball with you wherever you go! While your opponents let their guard down, you keep improving. No matter where you are, the reflex ball makes training and fitness easy. Get one today and make sure you're the champion in your next fight! FOR BEGINNERS, EXPERTS, KID BOXING, AND ADULTS - Whether you're just starting or already a pro, the Southpaw Fight Ball will take your skills to the next level. There are dozens of different activities to cater to your skill level. Speed ball training, reflex ball training, and more. We'll even send our most popular exercises, straight to your inbox. DURABLE, COMFORTABLE, AND EASY FOR TRAVEL - Made with only the highest quality materials. And equipped with a flexible headband for comfort, an adjustable ball cord to vary difficulty and ball speed, and a cushion rubber ball, durable enough to last years, and comfortable enough to train hours a day without worry of sore knuckles or bruises. 100% MONEY BACK GUARANTEE - We're so sure you'll love this product, we're offering a complete money back guarantee! Order a Combat ball before your opponent does. Start experiencing the benefits today! If you have any questions about this product by Southpaw Combat, contact us by completing and submitting the form below. If you are looking for a specif part number, please include it with your message.